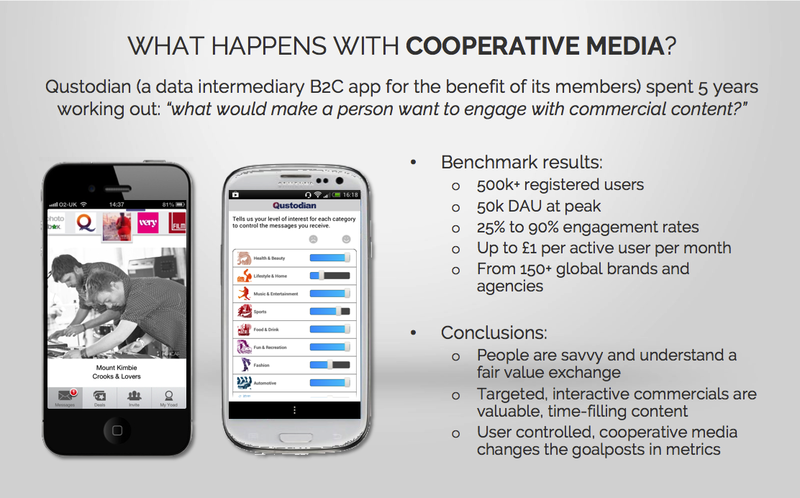 Cooperative media: a solution to publishers’ problems? Many of you from media-land will be familiar with the concepts of paid (bought advertising), owned (your own publications & sites) and earned (free publicity from promotional activity) media. 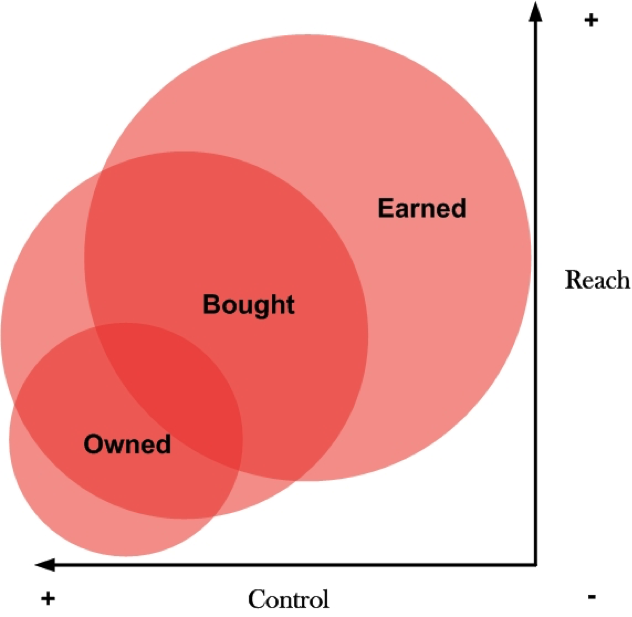 You may also be familiar with this graphic showing the trade-off between “reach”, the number of people you can promote to, and “control”, the ability to influence your brand message. There are some very significant pitfalls of this approach in the modern era of interactive media, particularly personal mobile devices. Clearly the “Broadcast media” principle of putting your message in front of as many people as possible in order to get through to those that may be interested is not acceptable in mobile (cue the adblockers). Also, developing a strategy of controlling your brand messaging in an era of instant social media sharing is risky. Consequently, earned media, such as ‘word of mouth’ and PR activities, have become increasingly of interest, particularly using the proliferation of social communication tools. Many publishers and brands are developing their strategies around ways and means to encourage sharing of brand messaging through conversations and viral activity. But significant problems remain with this approach too, including that people often see through the activity with cynical eyes, or may not be in the right frame of mind to join in the conversation you want to have. In fact, it is all part of what Alan Moore and Tomi Ahonen predicted 10 years ago in their ground-breaking book, Communities Dominate Brands. We’ve been discussing the evolution of media with Alan and Tomi (original investors in our company) over a number of years and they agree with us that we seem to have lost touch with the most important party in the value chain when it comes to the use of mobile as a new medium: People. Q. When you are interrupted on your phone by an ad, do you understand why the publisher (app or web) has put it in there? Q. At what point of interacting with your favourite apps, websites or services on your phone are you happy to be interrupted by an unsolicited ad? We ALL understand that services have to pay themselves, but we will tolerate advertising formats only up to the point that they become too intrusive and annoying and then we vote with our thumbs. Or maybe install an ad blocker. But, if people understand the reason for advertising and want to access free services, shouldn’t there be a better way? With enough computing power in our pockets to send a man to the moon, shouldn’t we be able to come up with a better ‘media’ solution for mobile? Cooperative Media is a “commercial environment” whereby people, publishers and brands can all achieve their objectives, for mutual benefit. It is underpinned by the true principles of engagement marketing as defined by Alan Moore as “the process of involving consumers in the co-creation of brand experiences”. What this means in advertising terms is that a set of circumstances are created whereby a person actively chooses to interact with commercial content for mutual gain, and not just that they view, interact with or click on a specific ad. By delivering these circumstances and an environment for commercial interaction that is separate from your core services you can engage your users in a new way that will generate income and value for all parties. In doing so, you can also build a better relationship with those users, as you understand better what they like. Practically, this might involve launching a commercial space within your service or publication, like an inbox or a separate brand sponsor page. When users visit this space, the purpose, value exchange and benefits to the user for their visit must be clearly communicated or be obvious. The key point is that those people who then return to visit that commercial environment, actually pay attention to what they see. And this attention allows you as a publisher to make money, as brand messages will get through to the right people. We are convinced that Cooperative Media that puts the end user in control can not only work, but can also improve the metrics expected from today’s advertising media by at least an order of magnitude. We will explore the concepts and ideas behind Cooperative Media in further posts, including where it sits in relation to paid-earned-owned media and how we see others implementing the principles.